Even if you’re not a diehard fan of the show, chances are you’ve at least heard about BBC’s super sleuthy series Sherlock , which just recently dominated at the 2014 Emmy Awards. It stars Benedict Cumberbatch and Martin Freeman — both of whom were unfortunately MIA at the Emmys — and is pretty much one of the best shows currently on television. (Yup, I just went there.) But, I mean, just look at the facts. Not only does it star two of the most charming Brits in the biz (I like to think of them as Sir Patrick Stewart and Sir Ian McKellen: The Early Years), but the overall quality of the show itself makes all others seem… well… elementary, my dear readers. And don’t even get me started on that adorable bromance (otherwise, we’ll be here all day). However, there are those out there who still remain skeptical of the show's value, which can be a very dangerous thing given Sherlock’s massive following. So, I figured now would be as good a time as any to pass on a few words of wisdom to all you non-watchers out there. 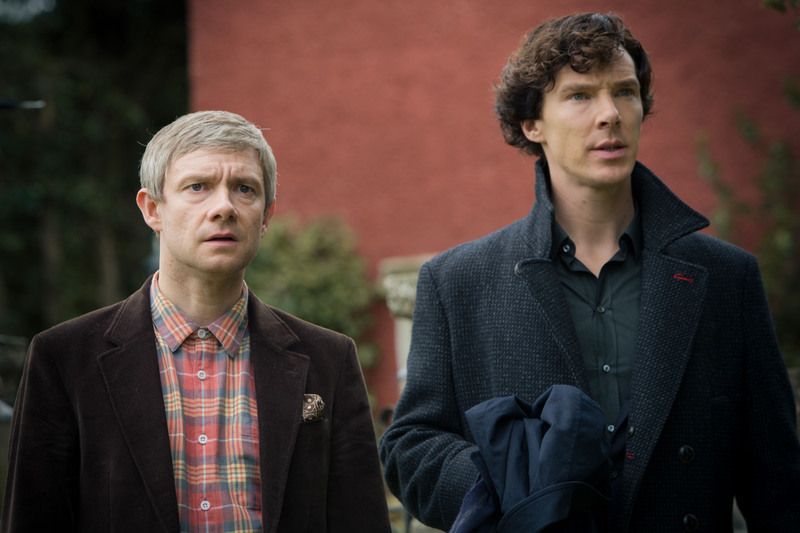 You might want to think twice before saying any of these things to a Sherlock fan. Want to know what else is lame? This conversation. Seriously, if you even attempted to watch just one episode, you would understand why Sherlock doesn’t need copious amounts of screen time to be instantly addictive and widely adored. Plus, each episode is 90 minutes long — way more than your average TV show. Sure, we’d all love more Sherlock in our lives, but given this incredible duo’s packed schedule these days, we should be grateful for anything we can get. Martin Freeman Is in Sherlock? I Loved Him in The Shawshank Redemption! That would be Morgan Freeman, not Martin Freeman. Both of whom are superb actors, but otherwise have absolutely nothing in common. Now please stop wasting my time. You shut your face this instant. Cumberbatch is an absolute treasure and I will not tolerate anyone saying anything to the contrary. What is it exactly that you don’t find appealing? His perfect cheekbones? His impeccable physique? His charming British accent and deep, sultry voice? I’m assuming you also don’t like puppies or pizza as well? Excuse me, you don’t know fast talk until you’ve watched an episode of Gilmore Girls. This is nothing. Also, if you find British accents to be anything less than positively amazing then I can no longer be associated with you. Kthxbye. Oh, I’m so sorry you have to wait three months for your fall shows to return. Did I mention that Sherlock was on hiatus for almost two years between seasons two and three? And season four's premiere date looks awfully far away as well. Get back to me when you have some real problems. I see. So you’re under the illusion that Doctor Who and Sherlock must be similar because they both share the same showrunner, Steven Moffat? That seems like a logical conclusion. After all, Ryan Murphy created both Glee and American Horror Story and they are totally about the same type of thing. Stop. Just stop it right there. Sherlock almost never gets the true recognition it deserves. I’m going to start calling you Jon Snow from now on because you clearly know nothing.